You finally pick the perfect paint color and are ready to buy some paint. The person at the paint counter asks “What sheen do you need?” and you have no clue. This has happened to everyone! 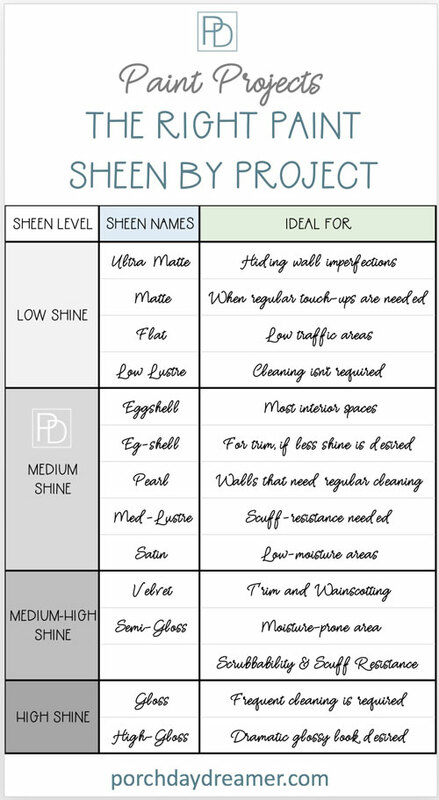 I’m here to help you know which sheen is right for your project! We will look at the available sheen options from Valspar, Sherwin Williams, Behr, and Benjamin Moore. 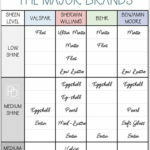 I’ll demystify each one of the sheen names and why one sheen is better than another by need. To me it is second nature after working for a paint company for 5 years, but I realize that most people don’t paint very often and the typical time between projects can be over 5 years! 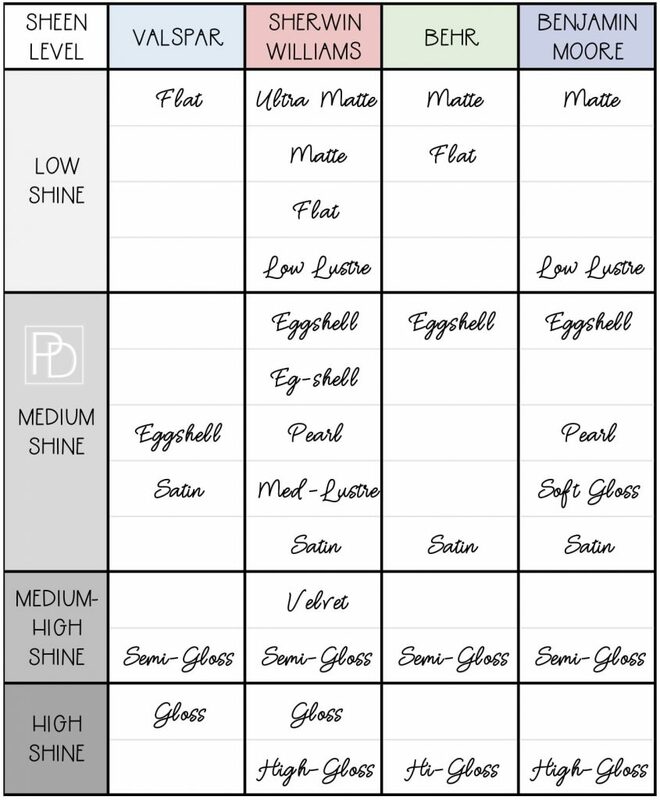 So when your next paint project rolls around, save this guide and you’ll be all set knowing exactly what sheen to choose. What is sheen you ask? It is how light reflective or shiny the paint is when fully dry. Sheen is not only how reflective a paint is, but each sheen delivers different characteristics that you may not be aware of. It’s important the paint performs and sheen will help the deliver the results you need. Phew, that’s a lot to remember and many of them mean the same thing! To help you out, I’m going to put the major paint manufacturer’s sheens grouped together. That way you will have the direct comparison of sheen levels and will know what brands carry each type of sheen. This will also be helpful when you are looking at different priced lines within a paint brand. 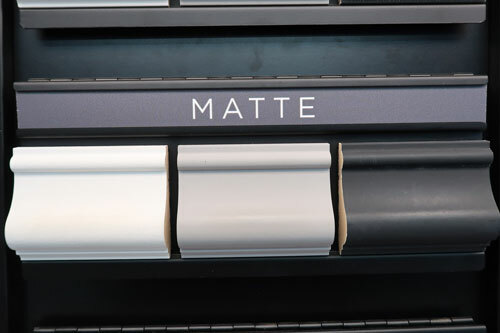 Manufacturers will use different sheen names for different lines of paint. Next, we will cover what changes as the sheen moves up in light reflecting quality. The higher the sheen / reflective quality the darker the same color of paint will appear! Something VERY important to notice about paint sheens is the more light reflective / shiny a paint sheen is the DARKER the color will appear! It’s very apparent on this Benjamin Moore sheen guide display how the same color gets darker down the guide and is the darkest when you get to High Gloss. Need help choosing a paint color? Read this post! Simply put “how shiny is the paint?” Easy, right? What changes as the sheen moves up and gets more shiny you ask? My local Benjamin Moore store was nice enough to let me take pictures of their sheen display. The easiest way to remember this is the shinier the paint the harder, more durable, and easier to clean the finish will be. Let’s look at it in detail. The surface of the paint will reflect very little light. Because the paint is reflecting less light it will also hide wall or ceiling imperfections. In feeling the paint, it will have more texture and feel the roughest of all the sheens. Chalk paints are considered low shine and matte. That is why they always have to be top coated with wax or a polyurethane. Chalk paint literally feels rough to the touch. 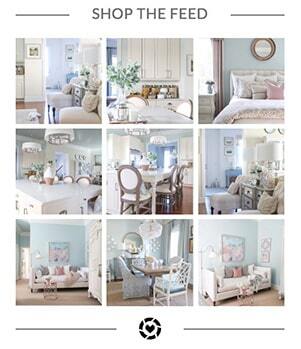 If you want to know more about chalk paint specifically, read this post. Because the texture isn’t smooth it can’t be cleaned, without “burnishing” the paint. Burnishing flat paint will make the paint more shiny in that location simply because you rubbed it to clean. We’ve all tried to clean our white apartment or new home walls (which are typically flat paint) and you are left with a very obvious mark where you rubbed. So lower sheen paints are NOT the best option when you have kids or in high traffic areas. You won’t be able to clean scuffs or marks. That is typically why ceilings are painted with flat sheen paint – especially since they are rarely if never cleaned. The good news about flat paint is it is easy to touch up because the low sheen hides brush and roller marks really well. 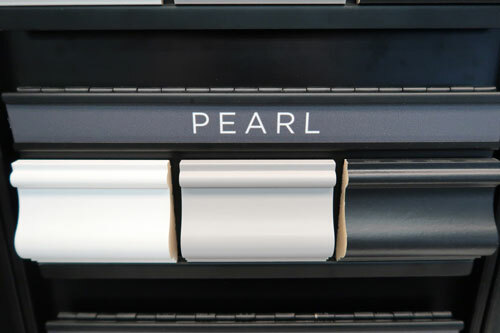 Pearl at Benjamin Moore is just like Eggshell from other paint manufacturers. This by far is the most versatile paint sheen. It’s like the best of all worlds and is the most used sheen for interior walls. Since it has a little shine to it, the finish is also going to be more durable. The texture is a little bit more smooth, so it can be cleaned quite easily. This is my GO TO paint sheen for every interior wall in my home. I’ve been able to clean Eggshell paints with a Mr. Clean Magic Eraser sponge and remove surface scuffs and marks. Because it doesn’t have much shine, it will hide many wall imperfections and I’ve even painted my ceilings with it! Satin sheen falls into this category and the first sheen you typically see used for cabinets, doors and trim. I’ve also seen manufacturers use Satin sheen in Kitchen & Bath paints. It’s going to be a more durable finish, but not super shiny. In high traffic areas, this is a great option because it’s easy to clean. Also, the harder the finish the better it resists dings and scuffs. If you want easy to clean walls in a damp area like a kitchen or bath, this is a good option. Some people like to use medium sheens for furniture too, but instead I recommend a completely different paint that is harder called an enamel. If you are considering painting furniture, read this post where I share my favorite furniture paint that doesn’t require a top coat and several projects where I used it. There isn’t much difference between the medium and medium high sheens. It’s more about personal preference. If you want a little more shine, then this is your option. 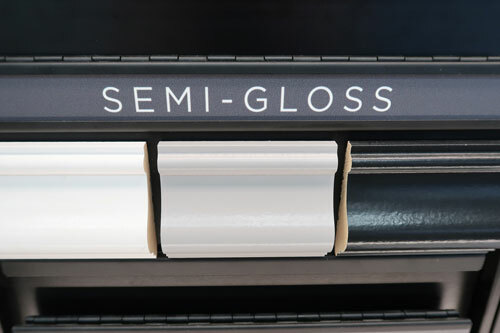 Semi-Gloss sheens are the primary selection for doors and trim because it’s even more durable than the Satin finishes. The hardness of the finish is also better for furniture and even in high-moisture kitchen & bath applications. High-Gloss and Gloss sheen are the shiniest of the shiny. Designers will use these shiny sheens to add drama in dark colors of paint, since they are really reflective. They are SUPER shiny! I’ve seen gloss sheens used beautifully on accent walls and ceilings. The designers don’t care about the durability, but the shine! 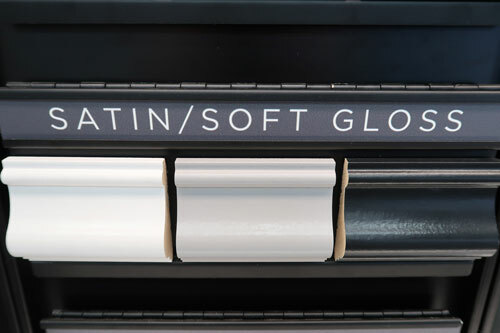 Normal folks like us like the glossier finish for doors, wainscoting and trim. This will be the hardest finish and easiest to clean type of sheen. It can also be a nice choice for an accent piece of furniture to highlight carved details. 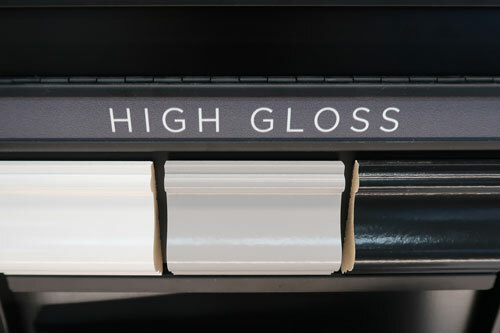 In all honesty, I’ve never selected a high gloss for any paint project because I typically use light to medium value paints. Now that you understand what happens to a paint as the sheen moves up in light reflecting quality you can make a better decision on what paint sheen to select. The lower sheens are best on walls, the medium level sheens for furniture, trim, doors, Kitchen/Bath applications, and the highest level sheens are for drama and maximum durability. Hopefully, seeing it all blended in a room by sheen makes more sense. As they say, a picture is worth 1,000 words! I chose semi-gloss in the same color of paint for the wainscoting not only for the extra durability on the lower walls, but also for a little drama. The color is slightly darker due to the shine and emphasizes the tone on tone look I was creating in the room. 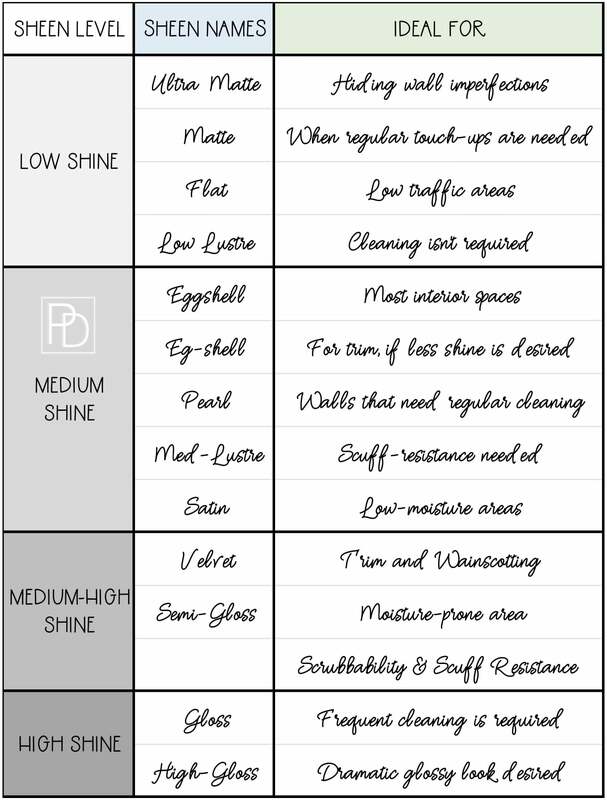 Here is a graphic, in addition to the one I shared above, that you can save and review before buying your paint. Because I can’t cover EVERY option I’ve more given you basic guidance. Satin sheen is one that can satisfy many needs, so if you are really unsure it’s always a good option: durable, cleanable, and can be used in moisture prone areas. It will darken the color slightly, so be prepared for that. Still confused? Always ask the person behind the paint desk and they typically will steer you in the right direction. 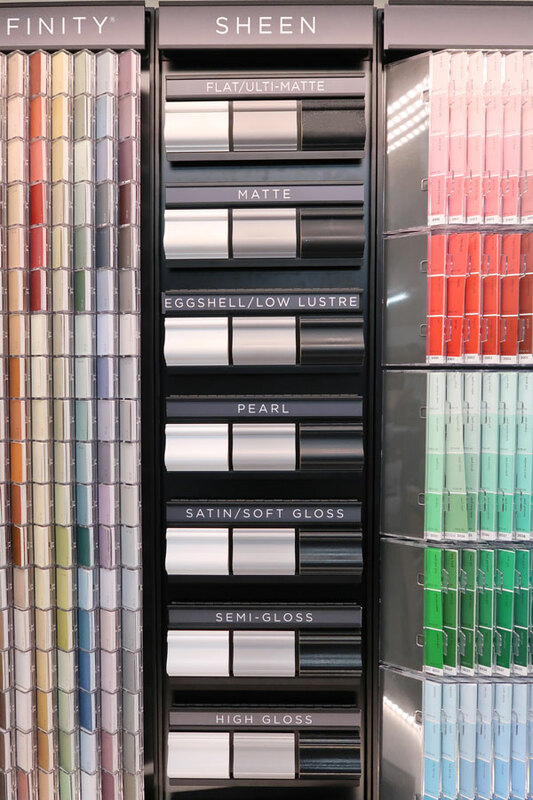 Knowing more about sheen will help you find the right paint in your budget and understand the higher end lines have fancier names like “Velvet and Pearl”. My favorite paint is still Valspar Signature in Eggshell, Satin and Semi-Gloss 🙂 It provides the best coverage and less splattering when rolling than any other paint I’ve tried. To me, it’s the best value for your money. Want more paint knowledge from my 5 years working for Valspar in the Lowe’s Home Improvement group and all of paint projects. Here is the perfect resource! 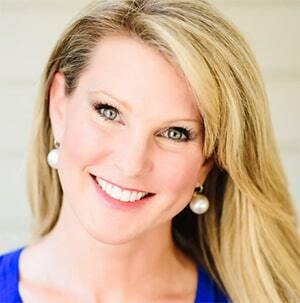 Please consider signing up for my weekly email newsletter, so you never miss a post! « My Secret Source for Affordable Outdoor Furniture!